HISTORY: BJ was just five months old when he was handed over to Lok Kawi Wildlife Park on March 2nd 2017. He was purchased in Sonsogon village, Pitas on February 19th 2017 for the price of RM 300 and then kept as house pet. The previous owner fed him primarily rice, meat, honey and fruits. He was sent to BSBCC on November 22nd 2018. 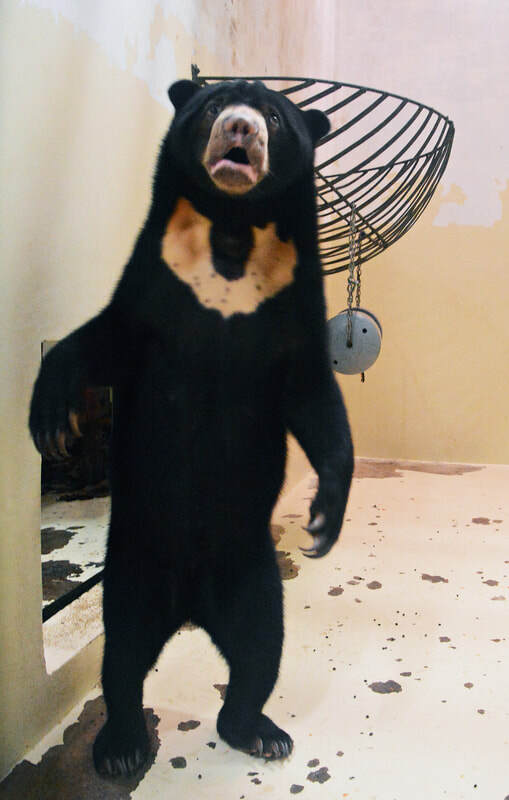 BJ was a healthy sun bear yearling when he first arrived with a weight of 33.8kg. PERSONALITY: Being still a young bear, he is filled with energy. He is very aware of all surrounding sounds, trying to better identify what has caught its attention. BJ developed a sweet tooth and enjoys eating all kind of fruits given to him.On the 14th of December 2018, BJ was integrated into a larger social group of female bears – Kina, Sika, Soo and Diana, who would help him adjust to his new life and learn how to be a bear again! Without any hesitation, He is always filled with curiosity and enjoys exploring the enrichment around the dens. He loves to spend time working out how to get use his enrichment and attempts to destroy it! His favorite past time is happily chilling at his cozy platform that was built by our keepers. BJ now starts to take his first steps onto the road to recovery. He will start learning and experiencing that life as a bear is good. IDENTIFYING MARKS OR TRAITS: He has a grey -whitish nose. BJ is available for MY BEAR adoption.